Cantaloupes appear to be a healthy fruit, however, they have been associated with potentially deadly salmonella and listeria outbreak. Listeria is especially deadly during pregnancy, and can potentially lead to a miscarriage or stillbirth. 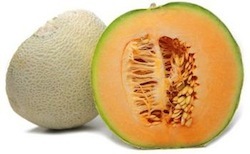 Over the last few years, cantaloupes have been associated with deadly listeria as well as salmonella outbreak. This makes the cantaloupe one of the few fruits associated with potentially worrisome infections. "If in doubt, don't eat it."